Michael-In-Norfolk - Coming Out in Mid-Life: Will There be a Youth Vote Wave? 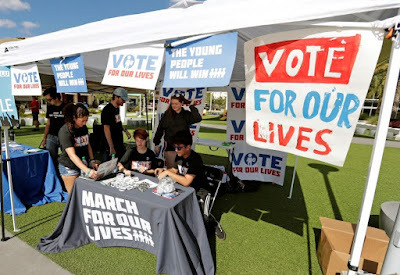 Youth turnout rates in the midterm early vote are up by 125 percent compared to 2014, according to Catalist, a voter database servicing progressive organizations — an eye-popping and historically high figure, say strategists on both the left and the right.  An “attitudinal” shift: A recent Harvard Institute of Politics poll indicated the most dramatic shift in their polling history is young people’s attitudes about whether politics makes a tangible difference in their lives. John Della Volpe, IOP's polling director, said pollsters saw a 15-point increase post-2016.  Per the poll: Forty percent of 18 to 29-year-olds reported they will “definitely vote” in the midterms (54 percent of Democrats, 43 percent of Republicans and 24 percent of independents).  2020 implications: Among young people polled, 59 percent said they would “never” vote for President Trump vs. 11 percent who said they'd be “sure to” vote for him.  Narratives vs. numbers: “Almost all of the data I’ve seen from the last two Harvard polls indicate a significant increase in enthusiasm, interest and likelihood of voting for people under 30 — so the data has been consistent but the narrative inconsistent,” Della Volpe told us.  GOP pollster: Chris Wilson, the CEO of WPA Intelligence, told us he thought it was a “bit too much” to call the turnout “historic.” But he said the electorate is looking younger “than both the 2016 and 2014 general elections. “Voters under 25 are outpacing their vote share from both the 2016 and 2014 general. · Civic engagement is cool: “Activism is becoming more of a normalized activity for teenagers — they are seeing their friends get involved with campaigns and issues and it’s spreading like wildfire,” Corin added. · Real progress: Since the Parkland shooting that killed 17, over 60 state laws have been passed tightening gun control. “The constant mass shootings are large motivators … it’s what has activated thousands and thousands of people across this country,” Corin said. I hope and pray younger voters, blacks and Hispanics turn out in high numbers and vote Democrat. If they fail to do so, I truly worry about the future which could turn out to be something very, very ugly.